Prepare to be wowed! Don this U.S. Divers' mask and snorkel combo and enjoy clear, panoramic vision and easy purging with the Lux LX mask and breathe easy through the Phoenix LX snorkel. Enjoy the underwater world! Prepare to be wowed! Don this U.S. Divers &apos; mask and snorkel combo and enjoy clear, panoramic vision and easy purging with the Lux LX mask and breathe easy through the Phoenix LX snorkel. Enjoy the underwater world! A properly fitted snorkeling mask should not leak. Snorkeling is fun but a big smile can cause a small leak. Sometimes hair stuck in the mask skirt can cause a leak too. A purge valve allows you to eliminate water through the one-way purge valve without removing or tipping your mask. If your mask has a built-in purge just exhale normally through your nose. The water will drain out of the purge valve. The purge needs to be at the lowest point in order to work properly. Revolutionary in design, some U.S. Divers masks feature patented panoramic lens technology that provides maximum peripheral vision and overall visibility. The front and side glass lenses are bonded together, eliminating the lens frame and providing an expanded and uninterrupted field of vision. Now you can expand your snorkeling experience with panoramic vision! U.S. 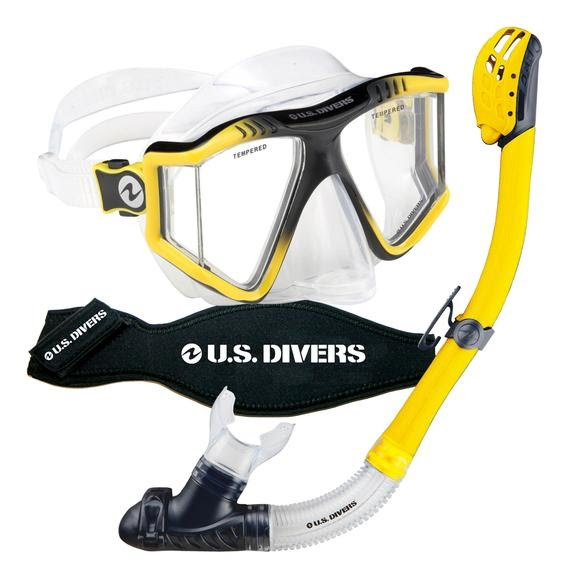 Divers offers a variety of patented &apos;Dry&apos; snorkel top designs that all close to seal out water when you go under water. While snorkeling on the surface of the water just breathe normally. When you want to dive under the water take a deep breath and then submerge. The snorkel will automatically close and seal out the water from the tube. When you resurface just exhale and breathe normally. As long as you keep a good seal with your mouth on the mouthpiece your snorkel will not take in any water.